In Kerala, there are many waterfalls which are either small or big. The beauty of the waterfalls is an inspiration for the poets, painters as well as writers. Those who wish to stay away from the crowd for relief can prefer to take a tour to the waterfalls in Kerala. It gives them relief and can feel and enjoy the beauty of nature. Waterfalls are definitely a must see destination for the nature lovers. The waterfalls cascade through the mountains and are mostly surrounded by dense forests. The beauty of the waterfalls together with the picturesque of the forest and mountains is really breathtaking. Adventurous tourists are also attracted to this place as they can engage in various adventurous activities such as trekking, rock climbing etc. The waterfall may be of different height that ranges from 100 ft to 2000 ft. Some of the major waterfalls of Kerala are Athirapally and vazhachal waterfalls, Palaruvi, Aruvikkuzhi, Chethalayam, Meenmutty waterfalls, Meenvallam, Perumthenaruvi, Soochippara, Thommankuthu, Thusharagiri waterfall etc. 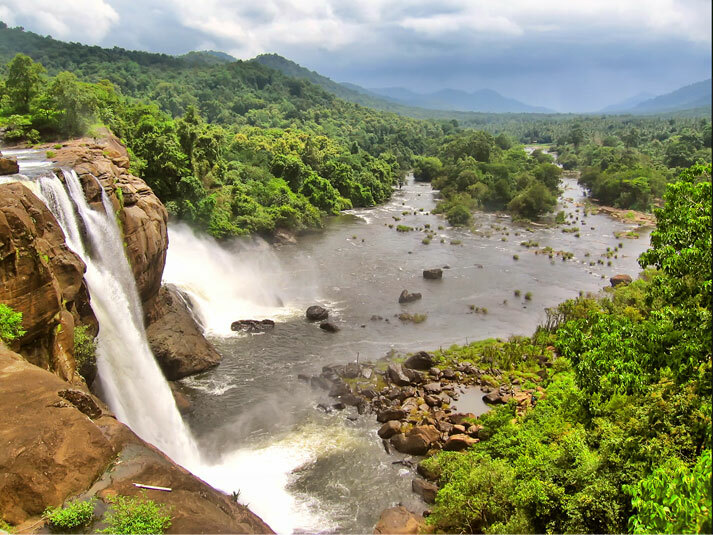 Athirapally waterfalls are located in the Sholayar range and are a part of the Chalakudi River. It is the largest waterfall in Kerala. The Vazhachal waterfall which is also a part of the river is near to the Athirapally waterfalls. Palaruvi waterfall is situated in Thenmala. The word meaning of Palaruvi is ‘stream of milk’ and this waterfall is given this name because it looks like a stream of milk. Aruvikkuzhi waterfalls are located in Kottayam district around 2 kms from Kumarakom. The water flows down the hill from a height of 100 feet. Chethalayam Waterfall which is a small waterfall with crystal clear water is located in Wayanad district. Meenmutti waterfalls are located near Kallar in Thiruvananthapuram district. It cascades in 3 levels at a height of 500 m. It is a great experience to trek to this place to see the waterfalls. Meenvallam waterfall is situated in Palakkad district. The water falls from a height of around 25 ft and the depth of the water is 20 ft. This waterfall has 10 steps and the 8 steps lies in dense forest. Perumthenaruvi waterfall lies in Erumely near Thiruvalla. The waterfall and its surroundings offer beauty and a scenic sight. The stream is spread in a wide area rather than the height and it joins with the Pamba River. Soochipara waterfall which is also called as Sentinel waterfalls is situated in Wayanad. The water falls from a height of 100 to 300 ft and is 3 tiered. It is one of the biggest waterfalls in our state. Thommankuthu waterfall is a small and beautiful waterfall having seven steps and cascades down from a height of 1500 m. Thusharagiri waterfalls lie in the Western Ghats in Kozhikode district. The word meaning of Thusharagiri is ‘snow covered mountains’. The whole area looks like snow capped, hence it is called so.